ISLAMABAD, Nov 18 (APP): President Mamnoon Hussain on Friday expressed profound grief and sorrow over the sad demise of Awami National Party (ANP) leader Haji Muhammad Adeel. The President said the late leader rendered valuable services for supremacy of democracy. Commending the role of Haji Adeel in politics, the President said that Adeel’s sacrifices for the cause of democracy will be remembered forever. 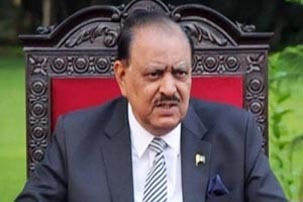 The President commiserated with the bereaved family and prayed for salvation of the departed soul.